Shapoorji Pallonji’s brief to the interior designer for the Imperial Avenue was to create a distinctive residential project that sets it apart from others in the region, combining timeless elegance and sophistication. 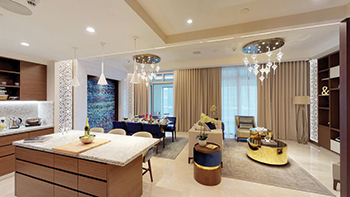 Intent on creating a lasting impression with its first residential project in the UAE, Shapoorji Pallonji is looking to redefine the urban living experience through Imperial Avenue, a luxury property situated in the heart of Dubai’s Downtown district. Overlooking the iconic Burj Khalifa. Imperial Avenue stands 45 storeys tall and features 424 apartments, three levels of free-flowing podiums and five levels of parking. The exclusive collection of luxury homes consists of one- to four-bedroom apartments, four- and five-bedroom penthouses, three-bedroom villas and four- and five-bedroom villas with private pools at the podium level. Shapoorji Pallonji has been a prolific Indian developer over the past few decades, having delivered a wide spectrum of projects, right from India’s tallest luxury towers to Asia’s largest mass-housing township. To achieve its goal in its first foray into the international market, the 153-year-old Indian developer has partnered with experienced consultants and architects Arch Group, Koltay and Cracknell. The 10,000-sq-ft entrance lobby at Imperial Avenue. 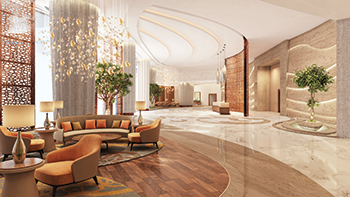 Interior Design Associates (IDA) has been appointed the interior designer and SPML – Interiors has been appointed the fit-out contractor, Cyrus Engineer, managing director, Shapoorji Pallonji (SP) International Property Developers, tells Gulf Construction. “The interior design works have commenced since December 2018 and are being carried out with utmost care,” he adds. 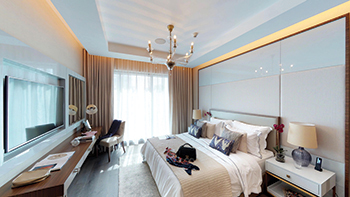 Imperial Avenue offers 135 premium luxury units and 289 luxury units. With modular kitchens, designer bathrooms and private decks, every apartment is claimed to be unique. “The development has numerous configurations given the landmark shape of the building and these have been designed in very modern and chic themes that would appeal to the distinguished buyer,” Engineer says. Like its name, the tower conveys incomparable levels of luxury and grandeur, through its numerous and exceptional amenities, with a promise to elevate its residents’ urban living experience. These include a premium lobby, rooftop infinity pool, family pool on the ninth floor, fitness centre, squash court, indoor and outdoor kids play area, private audio-video room and private function hall. 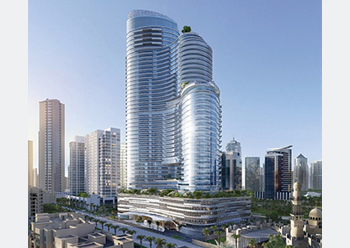 While Shapoorji Pallonji has been constructing landmark projects in the Middle East over the past 45 years as a contractor of repute, Imperial Avenue is its first ‘International development’ project. Hence, this landmark development is aimed to “showcase our development expertise to the world by delivering a premium and high-quality product,” Engineer emphasises. Imperial Avenue ... 45 storeys tall. The brief given to the interior design team IDA was to achieve a product that encompasses timeless elegance and sophistication, he says. “Given the prime location – the epicentre of one of the most prestigious districts in Dubai, the design and quality of materials used spell out ‘Luxury’. Apart from that, the designer was given full freedom to bring in freshness and uniqueness into the interior design to set it apart from other residential projects in the region,” Engineer points out. A major part of the interior design inspiration comes from the sweeping curves of the architecture. The designer has used bold curves on the floor plans, ceiling and walls to create a visual drama in the large public spaces like the lobby, multipurpose hall and gym, whilst using warm tones of beige, brown, and burnt orange etc for the materials. “The designer envisaged it as moving winds on a crisp autumn day, blowing away leaves and thus creating magical landscapes within various areas in the building,” he remarks. “I am confident that residents and guests will be delighted to step into our inimitable world aimed at offering an innovative lifestyle destination in the heart of Dubai,” he adds. The journey begins from the entrance. Starting with its cascading fountains, the soothing sound of the water welcomes residents and guests into a tranquil world. The 10,000-sq-ft lobby with its double-height luminous ceiling is resplendent in its design and architectural elements. A very thoughtful and calm reading area is available for those who wish to relax in the lobby, whilst enjoying the tranquillity and soothing surroundings. An Imperial Avenue show apartment. The apartments at Imperial Avenue follow the language of the public spaces. “They too spell luxury and sophistication at every corner. The warm neutral tones will easily form the backdrop to any style theme the individual end-user may choose,” Engineer explains. Attention is paid to the smallest details like automatic lights in wardrobes, task strip lights in kitchens, ambient cove lighting in ceilings, clean and simple hand pulls in kitchen cabinets, edge detailing in bathroom vanities and kitchen counters. Another key design element is the kitchen, where combinations of warm wood tones with cool glossy white lacquer tones create a contrast. With all the equipment being built-in, the look achieved is one of clean and timeless elegance with functionality. The bathrooms have been designed in such a way that the warm and rich hues of the materials used infuse a sense of being in a luxurious spa – refreshing and yet easily maintainable. The impressive 45-storey building hosts a number of best-in-class amenities and splendid designs. These include a dedicated audio-video room, allowing residents to entertain their guests with a private screening area, and a fully-equipped gym with state-of-the-art equipment. Considering the importance of inclusion, the tower offers different recreational areas dedicated to all age groups. A stimulating playground located on the ninth floor will have the little ones enjoying active playtime while the clubhouse situated on the 26th floor will allow adults to relax in a cosy atmosphere with access to a large variety of collective board games. The tower also has two deck floors with infinity pools located on the ninth and 26th floors respectively. Apart from state-of-the-art appliances used in the living spaces, thoughtful in-house features, seamless hidden technology, energy-efficient room design, intelligent security and access control are all hallmarks of the tower’s understated luxury. While Imperial Avenue exudes intelligent design and intuitive services, it also plays an important role in conserving energy. Aligned with the vision of the UAE to provide 75 per cent of its total power output from clean energy by 2050, the tower’s facade is fitted with solar panels. Additionally, the building has a greywater treatment system providing sufficient water supply for the entire project. While 40 per cent of the construction has been completed, Shapoorji Pallonji has confirmed the expected date of final completion of the Imperial Avenue will be the fourth quarter of 2019.